Understanding the source regions of soluble salt-rich dust is critical for military operations, monitoring potential environmental health impacts to military personnel, and for mitigating abrasion and corrosion to military materiél operating in desert regions. Arid regions are characterized by saline soils which are formed by a lack of precipitation and influenced by surrounding and underlying geology, among other factors. The dust content in soils and surface sediments in southwest Asia is commonly associated with specific landforms. This paper uses a soil-geomorphic conceptual model that integrates geographic datasets of Landsat imagery, soil and landforms, precipitation data, and geologic maps to produce derivative map-based predictions of the spatial distribution and content of salt-rich dust-sized particle in soils and surface sediments in the region. The derivative map is based on three regional dust and salt content maps and the assignment of a five-fold rating class and numerical factor value system to individual map polygons [e.g., Very High (5), High (4), Moderate (3), Low (2), Very Low (1)]. The three regional maps include: (1) dust content based on the identification of distinct landform assemblages from 15-m resolution compressed LANDSAT TM+ imagery at a scale of 1:750,000, (2) salt content developed from 1 km2-resolution mean annual precipitation data, and (3) geologic-based salt content developed from published geologic maps. 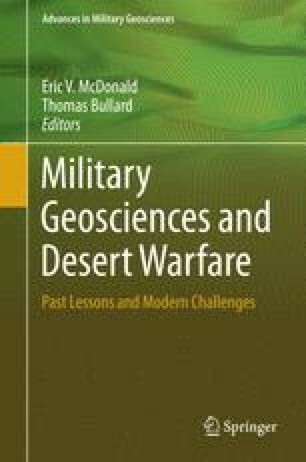 This study presents an initial step towards the prediction of salt-rich dust sources at regional scales that is aimed to provide information to planning military operations and for mitigating the hazards of dust on military personnel and equipment operating in desert regions. The approach used to predict dust and salt sources could also be used to refine atmospheric dust loading models that require knowledge of the spatial distribution of geomorphic-based input parameters. We acknowledge S. Bassett and T. Minor for geographic information system support. We also thank M. Reheis and D. Gilewitch for their comments and suggestions that strengthened and improved this paper. Research was partially supported by the U.S. Air Force Research Laboratory (FA 8501-06-D-0001), the U.S. Army Yuma Proving Ground, Natural Environments Testing Office (W9124R-07-C-0028/CLIN 0001-ACRN-AA), and the U.S. Army Research Office (DAAD19-03-1-0159 and W911NF-09-1-0256). The views and conclusions contained in this report are those of the authors and should not be interpreted necessarily as representing the official policies, either expressed or implied, of the U.S. government.